Need lighting or equipment for your next party or corporate event? Larkin Lighting and Electrical has a range of lighting and AV products available for hire. Our extensive projection range includes equipment suitable for large scale events and theatre production. Call us now to discuss your Murwillumbah party hire needs. Our Murwillumbah party hire shop has all types of lighting to set the mood for your next party or function. From mirror balls and smoke machines to commercial lighting and projection. Delivery and set up also available. We have many electrical equipment and party hire options for private functions and corporate events including cool rooms, generators and large coverage lighting. Ask us about Murwillumbah party hire today. The secret to a great party is lighting. You can set any mood you like with the flick of a switch. We are Murwillumbah party hire lighting specialists with a huge range of party lights, theatre lighting and electrical equipment available for weekend or longer hire. Our Murwillumbah party hire services gives you the option to collect and return the equipment yourself at our Murwillumbah store – or we can provide a quote for delivery and set up. It’s that easy to make your next party, AV presentation or theatre production shine! We also have specialist lighting for theatre productions and corporate staging. Choose a service that suits you. Either collect from us or we can deliver and set up equipment for you. Mirror ball, motor and spot, smoke machine, laser, moving head, 4 x led par cans. Many options – please contact us to discuss your requirements, from $100 per night. 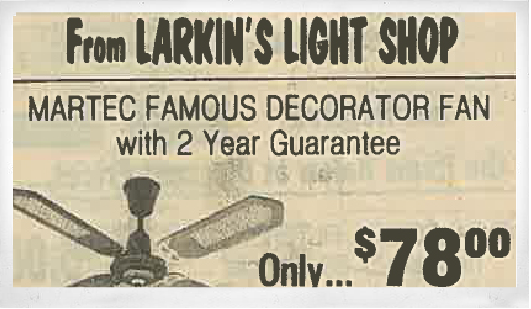 The Murwillumbah electrician team at Larkin Electrical have been called on to create many innovative solutions over the years. Back in the day, Jim Larkin had many usual requests. From wiring old style standard lamps to manufacturing something to stop breeding sows from rolling on their piglets! Got an usual electrical job? Contact the innovators in electrics at Larkin Electrical to see what we can do for you.